Achal Patel M.D. received his medical degree from Boston University School of Medicine which was followed by a one-year internship at Tucson Hospitals Medical Education Program, a three-year ophthalmology residency at University Hospitals/Case Western Reserve University and a one-year fellowship in cornea, external disease and refractive surgery at the University of California- San Diego. During his training Dr Patel has had the opportunity to work at the LV Prasad Eye Hospital in India where he performed complex cataract surgery on many under served patients and was exposed to the rare corneal pathology from a referral base of 100 million people. 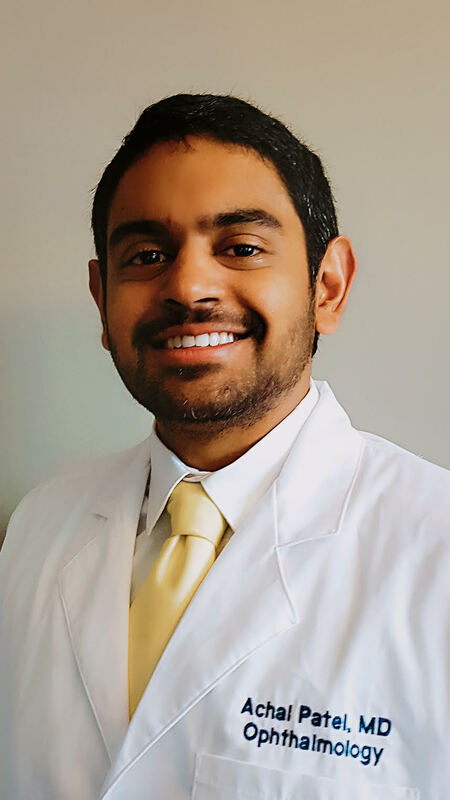 His knowledge of Corneal and External diseases is reflected in his national ophthalmology examination (OKAP) scores of 100th percentile in his final year of residency. As both a resident and fellow, Dr. Patel has completed numerous surgeries with the Veteran Affairs hospitals both in Cleveland and San Diego. Moreover, during his fellowship, Dr. Patel taught Resident Physicians cataract surgery, while performing multiple Corneal transplants to care for the veteran population. He has had systematic training in PRK and LASIK surgery and performed many refractive surgeries at the San Diego Navy Medical Center on active duty navy personnel. Dr Patel was born and raised in Phoenix and is excited to practice in the community he has known as a child. He is passionate about travelling and has been to over 30 countries.